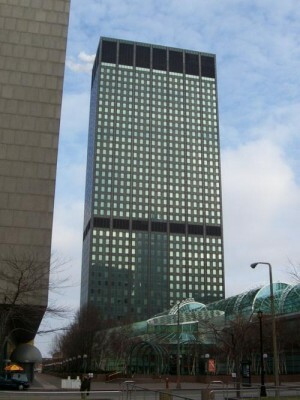 The Erieview Tower (also known as the Tower at Erieview, 100 Erieview, or the Erieview Plaza Tower) is a skyscraper located in downtown Cleveland, Ohio. The building has 40 stories, rises to a height of 529 ft (161 m), and has 703,000 square feet (65,300 m) of office space. It was built at a cost of $24,100,000. The tower was the first and most significant structure of the Erieview urban renewal plan initiated by Mayor Anthony J. Celebrezze in late 1960. The project was originally conceived as a 163 acre (66 hectare) urban renewal area spanning from East 6th to East 17th Streets between Chester Avenue and Lake Erie. Architect I. M. Pei authored a master plan with extensive parks and greens subdivided by lengthy low-rise structures and a few stark high-rise buildings. The 40-story tower was to be the hub of the Pei plan. Developers John Galbreath and Peter Ruffin broke ground on Harrison and Abramovitz's modernist skyscraper in early 1963. Construction went swiftly on the dark-green-and-black wall structure and a massive tree-lined plaza with combined fountain/reflecting pool/ice rink, linking it to East 9th Street.